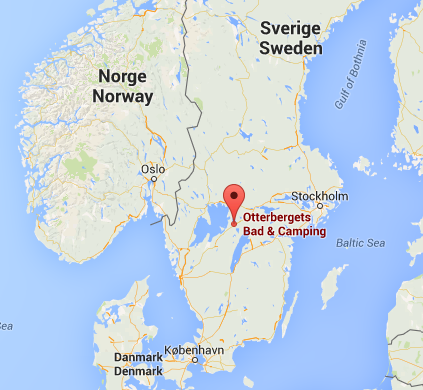 In the area surrounding Otterbergets Bad & Camping various events take place during the summer season. The camp site’s calendar of events displays events on the camping site and the surrounding area. t-shirts and all kinds of items related to music. Most objects are second hand collector items. The Sunday is traditionally the day of the old bakelite records. Each year in the beginning of July a Medieval week is held in memory of the Battle of Hova. This event is one of the biggest in Scandinavia. The battle near Hova took place on June 14th, 1275 and was fought by the knights of Waldemar Birgersson (king of Sweden 1250-1275) against the Danish cavalry under command of the Swedish brothers Magnus and Erik. The outcome was that Waldemar was forced to flee to Norway and Magnus, known as Magnus III, became king of Sweden (1275-1290). 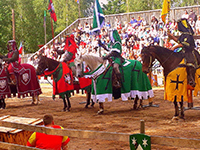 The Medieval week offers a colourful re-enactment with knights, sword fights and tournaments. Light entertainment for the public is provided by jesters and jugglers. There is also a medieval market with traditional hand crafts, food and drinks of this period. For more information: www.riddarveckan.com. 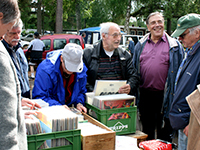 During the summer you can visit various local markets, like those in Finnerödja and Hova. These are pleasant market places where you can buy either second hand or new goods. Music is made and various delicacies are sold.